Long rooted varieties, such as the ones we offer, need a deep soil which is light, well drained and stone-free. Carrots prefer an open site. The ground should not have been manured for at least a year before sowing. Thorough deep winter digging is important, and in March a fine tilth needs to be prepared. 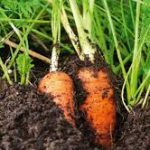 Sow carrots very thinly in 1cm deep drills which are 15cm apart. Cover the drills. Sow May for Nantes. Sow May/June for late maincrop Berlicum. When the seedlings emerge, thin them to 5cm apart. Do this late in the evening. Remove the thinnings to well away from the site. Water and firm the rows after thinning.Carrot rootfly can be a problem. Carrots can be grown with net barriers around. Fine net at 60cm high stops the rootfly yet allows ventilation of the plants. Hoe between the rows. Keep completely weed-free. Mulch between the rows to retain soil moisture. Harvest Start by pulling the early sowings, such as Early Nantes. Pull by hand as soon as they are big enough to eat. Later carrots which are intended for storage, such as Berlicum, can be forked up gently in October. Carefully remove the soil from these, cut the foliage to 1cm from the roots, and store only the sound ones. Pack in boxes of dry sand without the carrots touching each other. Cover with net if mice might be a problem. and store in a cool frost-free place.